On January 20, 2011, while the Congressional Agriculture Commission was grilling Tom Vilsack to make GMOs more easily deregulated (unbeknownst to me at the time), I was in a hotel in San Francisco at 7am, in that hover state between awake and asleep. I'd been depressed about GMOs for a long time and they came into my consciousness. As I drifted in and out of that awake state, it came to me: It was my job from that day until the November 2012 election to get an initiative on the 2012 CA ballot so that the people of California could vote and bypass the corporate control of our legislatures (both federal and state) and require that informed consumer choice supersede nontransparent corporate profit. The vision, to create a Ballot Initiative to Label GMOs in our food in California, was not limited to this initiative alone, but to create an army of peaceful warriors, committed for the long term to change our food system, bit by bit, while always remembering our power to effect change when we unite. I took 6 weeks to get prepared and develop a strategy. I then went live with the website and took to the road on March 10. Since then I've been traveling around the state, telling my story, hoping others would join me. We created The Committee for the Right to Know, which is a grassroots coalition of consumer, public health, environmental organizations, and food companies in California that is seeking the labeling of genetically engineered foods (GMOs). We are now an ever expanding ‘WE’! Over 100 community leaders throughout the state have embraced the vision, even though we had no way of knowing where this would go. They have been educating their communities at tabling events, showing films, speaking to their local groups. These leaders have committed to continue to take this action right up to the election. Once we get this on the ballot, we will continue to organize and educate our neighbors and then do heavy, organized grassroots campaigning starting the in summer leading up to the election. We are proud to have the organizational support of David Bronner of ‘Dr. Bronner's soap’, The Center For Food Safety, Organic Consumers Association, Mercola.com, Nature's Path, and the Institute for Responsible Technology, who are all involved now. On November 9, 2011, the coalition submitted the California Right to Know Genetically Engineered Food Act to the State Attorney General for title and summary, prior to circulation as an initiative measure for the November 2012 election. And we are now amplifying our efforts to get volunteers on board to gather 850K signatures from January 4- April 18. We are also asking other NGOs and consumer groups to join us in an effort to increase the "supporters" list before we make an official large press release at the beginning of that gathering phase. The energy is building. Our website is www.labelgmos.org. The coalition website should be out soon. We are reaching out to everyone to help us spread the word, as this will require a universe of support, both large and small, as I'm sure I don't have to remind you of who we are up against. We need volunteers. We need money for next year's media campaign. Between this law and our educational efforts, I am convinced that this will impact the world...so right now we need the whole country to join us to get this done. Please visit the website for more information and contact me with any ideas or questions. Help ensure the safety of food for California families and children. 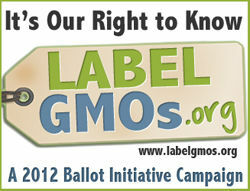 Let's get labeling of genetically modified foods on the Ballot for 2012.